It is kinda like a candy bar, for grown-ups. Preheat oven to 350 degrees F. Line sheets with parchment paper. Combine the butter and sugar in the bowl of a stand or hand mixer. Beat them together on medium speed until light and fluffy, about 3 minutes, stopping once or twice to scrape down the sides of your bowl with a rubber spatula. Add the vanilla extract and beat for a few more seconds. Reduce the mixer speed to low, then add the almond meal-flour mixture a little at a time. Beat just until just incorporated into the dough — don’t overmix. Scoop teaspoon-sized balls of dough (melon scoop size) and roll them to form small balls. Place the balls about 2” apart on the parchment-lined baking sheets. Using your thumb, make an indentation in the center of each cookie. Make sure you don’t press through the dough. 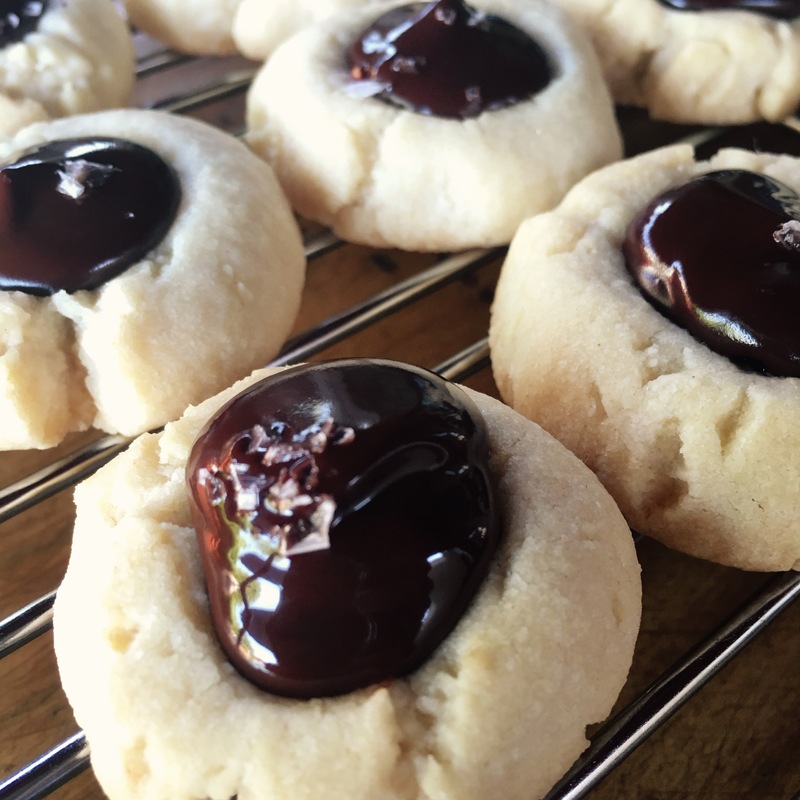 Add a tiny dollop of raspberry jam in the center of each cookie. Bake about 15 minutes, or until the cookies are only slightly colored around the edges; be careful to not overbake. Remove the baking sheets from oven and transfer the cookies to cooling racks.